Lighting your home might seem like a no-brainer, but there’s actually more to it than meets the eye. Creative, energy-efficient lighting does more than just look nice; it also can maximize the functionality of your living space and save on energy costs. If you’re still using standing lamps or flush-mounted fixtures, there are some small, inexpensive changes you could make that would increase their illumination properties and make your lighting more effective. Being “energy-efficient” simply means that you are taking steps to use less electricity or natural gas. Aside from preserving the planet, this also means that you can lower your monthly household costs. And, be creative! Energy-efficient lighting can be a combination of task lighting and ambiance in order to suit both your functional and decorative needs and wants. First, though, there are a few features to look for in any lighting scene that could help you save on energy. Choose the best energy-efficient bulbs. In most types of lighting fixtures, you can swap out traditional incandescent bulbs for others that will save on energy and offer more illumination. The best energy-efficient light bulbs have either LED or CFL technology. 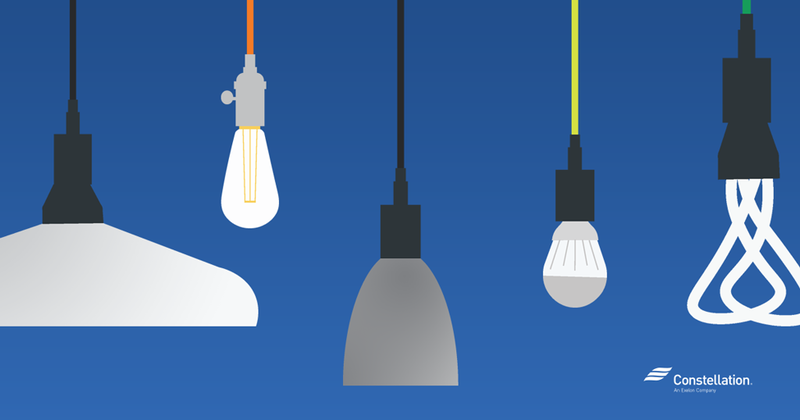 As a way to differentiate, CFLs are the “curly” bulbs and LEDs are usually long, thin ones. LED bulbs emit light in a specific direction, so they are a great choice for recessed downlights — common in kitchens and bathrooms — or task lights. While CFLs use 25 to 35 percent less energy than incandescents, LEDs are the best energy-efficient light bulbs for several reasons. One is that LEDs emit little heat; the biggest benefit, though, is that the typical life of an LED is 15 to 25 years, where a CFL is about 10. LEDs also provide more illumination while using less energy, which means long-term savings for you. 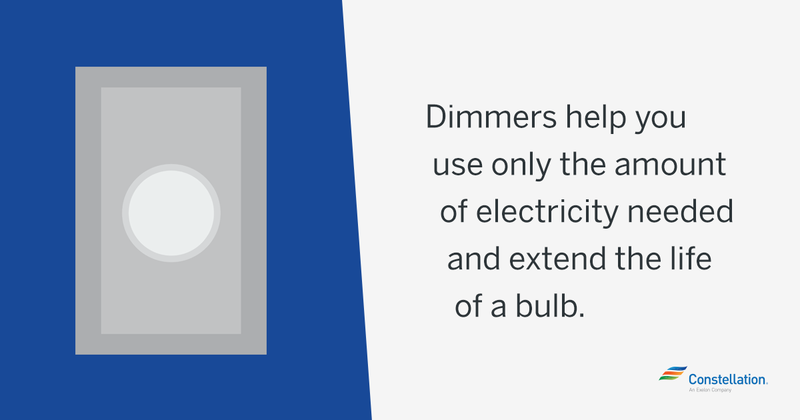 An LED with a dimmer will maximize energy savings. An LED bulb on a dim setting would produce very little heat and retains its color, even at a low light setting. A CFL bulb uses less energy than an incandescent bulb, but the bulb must be compatible with the specific dimmer mechanism. If it isn’t, you could have a serious fire hazard. A halogen bulb will use 20 percent less energy when dimmed than when it is on at full output. These are still incandescent lights, though, so the more you dim, the less efficient the actual bulb will be. One thing you should realize is that if you’re looking for a permanent low-light solution, you would be better off opting for a bulb with less illumination overall (i.e., fewer watts or lumens) than using a higher-illumination bulb and always keeping it dim. Timer-controlled lighting. There are different ways to manage creative, energy-efficient lighting with timers. One is to create a smart home environment by using a home hub like Constellation Connect, or a device like Amazon Echo or Google Home that will be compatible with your lights so that you set them to be on or off at specific times. If that seems too complicated for your needs, you could always use the traditional timers that you plug into an electrical outlet on one side and a lamp on the other. The benefit to these is that they are easy to program, inexpensive to purchase, and ultimately serve the same purpose as the more sophisticated models of energy-efficient timers. The only real disadvantage is that they can be used only with actual lamps; overhead lights or fixtures would generally not be able to be used this way. Once you have your energy-efficient timers set, then what? How does this help save energy? Using timers saves energy because you are making sure that your lights are on only when you need them to be. A lot of people believe in leaving a light or two on in the house when they are traveling or out at night as a deterrent to burglars. Instead of leaving a light blazing for an entire weekend, or during your vacation, or even on a day-to-day basis if you regularly get home after dark, you can set a timer so that your lights will go on and off at dusk and dawn, respectively. It prevents those lights from being on during daylight hours, but makes sure that your home has a nice glow at night. What are the best types of energy-efficient lighting fixtures? Sconces, pendant lights, recessed lights… if you watch a lot of home improvement shows, you might have a preference as to which you prefer based on style. While appearance is certainly important, you can also create a lighting environment that is beautiful, comfortable and saves on energy. Recessed lighting is a popular, modern solution for having a bright space; it’s commonly used in kitchens, bathrooms, and hallways because it can be configured in order to allow for strong illumination and saves the space that lamps or other fixtures would use. Use downlighting to brighten an entire room. If you have a traditional-height ceiling, place recessed lighting fixtures about four feet apart, using six-inch diameter vertical fixtures. A single vertical fixture directly over a specific area is a good option for task lighting. If a recessed light fixture is going to be installed in a ceiling where there could be indoor or interior air leakage, there are airtight designs with sealed canisters. There should be an airtight seal in between the ceiling and energy-efficient recessed lighting fixtures. This is important if the ceiling borders an unconditioned attic and also if the lights are going to be in an unheated basement ceiling in order to minimize drafts in between floors. A pendant light can also be called a “drop” or “suspender.” It’s a single fixture that hangs from the ceiling by a cord, chain or rod. Often, you’ll see multiple pendants in a space; they’re popular right now to light kitchen counters or islands, in bathrooms, and in other rooms as well. “Traditional” ceiling fixtures tend to be flush-mounted which means that they are snug against the ceiling, and the bulbs are either partially or wholly enclosed. Pendant lights are one of the best ways to achieve task lighting in a specific area. “Task lighting” is exactly what it sounds like — a light that is designed to illuminate your workspace for a specific task. For example, if you have a few well-placed pendants over a kitchen island or counter, the light is concentrated where you need it for reading recipes, measuring ingredients, chopping veggies or whatever else you’re doing. This is an energy-saving technique because it allows you to illuminate a specific area or concentrated work space without having to light the entire room as brightly. Use small LED lights. LED bulbs are excellent for low-hanging lights because they have less glare than other bulbs. Check the illumination range to determine spacing. Before purchasing a pendant light, see how many lumens its bulbs can accommodate and what the range is for the light produced. 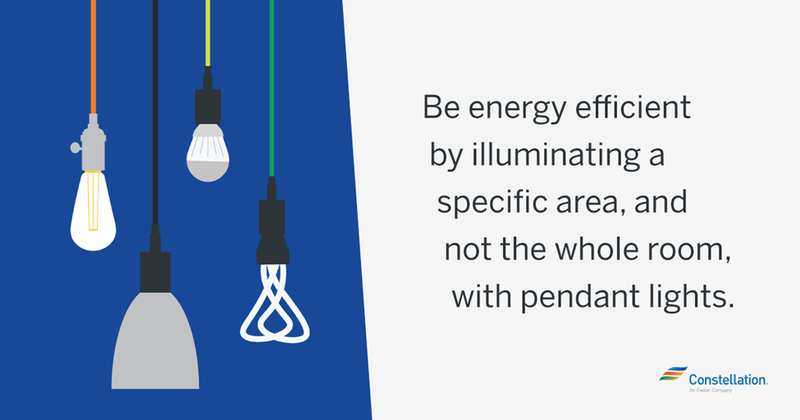 Putting pendants too close together will not give you more light, but it will make them less energy-efficient. Pendant lighting is designed to be either stand-alone or in sets, but spacing is important. Identify the areas where you need extra light. You might not need super-bright light in every part of your bathroom, but perhaps you want it over the vanity to use when applying makeup, for example. If that’s the case, a single recessed light in the center of the bathroom and a pendant light over the vanity could be a perfect solution, depending on how large the room is. Remember, regardless of which of these types of lighting fixtures you use, it makes a difference to look for EnergyStar-certified products. Energy-efficient dimmers, timers and fixtures all help when it comes to saving on electricity costs, and so does your use pattern. Even the best energy-efficient light bulbs should only be used when you need the light; encourage your family members to turn off lights when they leave a room — and you do the same — and think about how to adjust your habits in order to streamline your overall energy use. If you’re interested in learning more about how much energy your appliances use, take this quiz to find out! Thanks admin for your valuable info.The first step in designing any lighting system is to determine what you want the light to do for you.A low voltage system is flexible. You can easily move fixtures to accommodate plant growth or to change lighting effects. Low voltage systems are safe and energy efficient. Transformers reduce the standard voltage from 120 volts to a safe 12 volts. There is no risk of electrical shock to children or animals if the cable is accidentally cut. Lamps use less wattage and may not have the brightness of 120 volts, higher wattage lamps. Hi Rojer, You make some great points! Thanks for adding to the energy conversation. Excellent information! I read it all and appreciated what I learned. Thank you! We’re so glad to hear that. If you want to know more about lighting and energy efficient lightbulbs, check out our blog post on cfl vs. led bulbs!